Today Scrapper's Delights has an wonderful super Springy new release!!! My project below is using one of those wonderful images!! That's it!! 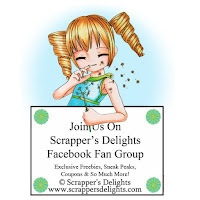 I hope you my card and I hope to see you stop by the Scrapper's Delights challenge blog and store!! There is so much to look at there and lots of crafty friends and fun!! Cute little scene...love the colors...Thanks for joining Crafty Friends challenge! What a CUTE image! I love the scene you've created! Thanks for joining us at My Sheri Crafts this week!